Home Back Forward August 23, 1998: Anthropomorphism. The attribution of human feelings to those of an animal has met with a lot of criticism in many circles ranging from scientific ones to artistic. As soon as an artist draws a cat or an owl and makes it look like it has emotions, the work is relegated to a category where it is not taken seriously. 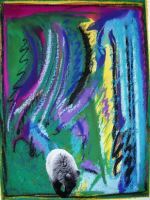 Thus when in the 1980's when I first used an animal in my paintings (the horse in the Beauty Pageant series), I was fearful of the outcome in terms of my professional reputation. I managed to crab-walk around the issue by using horses as symbols of beautiful women, alone and beautiful, objects of an uneasy objectivity. With the "women's liberation" movement in full gear, my work, in spite of its animal content was considered worthy of a national Canadian museum tour with many positive critical reviews. Now that I have entered the world of the bear, 15 years later, I feel more nervous than earlier. I am omitting issues that could politically save my artistic neck and grappling with the feelings animals have that are similar to a human's with no other interpretation intended. When I meet a person, it is only guess work as to what they are feeling at a given moment. As I get to know this person better, I am likely interpret their feelings with a greater degree of accuracy. Likewise with our 3 cubs. Now that I have formed a relationship of friendship and trust with them, I think I can start interpreting their emotional world. With the painting Entry: Chico, Biscuit and Rosie, I am using the dreaming bears in a semi abstract doorway to illustrate where I am on this path of discovery. I am at the beginning - looking intuitively into the emotional world of our bears, looking for similarities between my feelings and theirs. With Searching: Biscuit and Rosie and Searching: Chico, I am thinking of the frustration these bears felt for so many weeks as they literally combed the lakeshore of Kambalnoe Lake searching for the first salmon. I was so much in sympathy with their quest, I threw a rock in a pool of water, 4 foot deep, to draw attention to Chico that their was a dead fish at the bottom. She put her head under water and snorkeled around for about 10 minutes, but soon had stirred up the water to such and extent , visibility was impossible. She swam over to me and put both paws around my boots, forgetting the strength of her grip with her beautiful claws, which invited a sharp verbal reprimand from me. A week later I walked by this pool again. Chico jumped in and would not come out, seemingly in search of the same fish. She began to make shallow dives, snorkeled until she almost had no her breath, appeared in anguish in her need to find this object I had drawn her attention to a week earlier. I went to her and called her out of the water and walked away. She stayed, still trying. Finally I figured it out. She thought I had reprimanded her verbally for not succeeding!! I apologized for this misunderstanding. She finally followed the other cubs and I up the creek. A few days ago I came upon the cubs as they were catching Pink Salmon in Char Creek. I called as I approached. They did not want to stop this wonderful fishing opportunity to greet me, but ran over with their latest catch to eat nearby before returning to the creek for another fish. Chico caught my eye as she skillfully rousted a fat fish from under a rock and brought it to shore. I praised her. Her delight was hard to describe and it almost brings tears to my eyes to think how little we know about these sensitive animals. 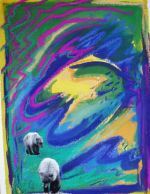 Now as I near the end of my stay here in Kamchatka for another year, I wish to isolate the feelings I have identified with our bears and paint and talk about them. I have wrestled all summer as to how to do this, but I think with a combination of realism and abstraction , it is possible. 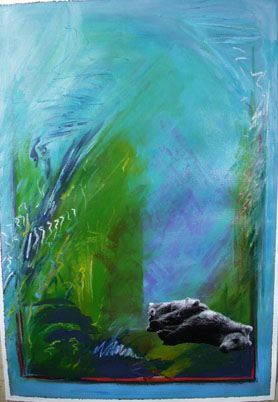 The realism will be clearly what I visually see and the abstraction symbolic of what I think the bears are feeling in a given circumstance. Please wish me luck!